I bring my own laptop to classes. With my own IDEs of choice. If a teacher dares tell me what inferior application to use, I skip that class. (Luckily exams are handled via an automated system so teachers getting revenge on me is out of the question.) But all of my teachers are great and actually look at better tools when presented with them. My attendance record therefore remains at 100%. See difference is your 21, I'm 15 I still go to high school so I don't have a say in the matter. I went to high school too. When they put that 10 years old Borland Delphi Pascal thing in my face I told them no thanks. I taught my teacher PHP instead. We spent most of the year working on a photo gallery instead of writing Windows Forms Applications about "Hello World" and "Click this button to make it red". Lmao, I have to write up programs that run equations and blooby blah, went through def functions and try statements (although I just used 'For' loops for those parts) almost starting on lists, should be interesting. 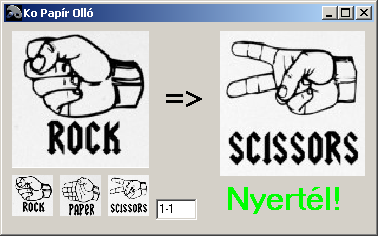 Oh and I made a Rock Paper Scissors game, you jealous? I made an RPS game too. Way back... It plays itself. And the limited AI eventually reaches a 33.3...% win percentage against itself. A game that plays itself? So I put it on a timer and just printed out the results. And win/loss/tie statistics. For each hand. For each AI. I think I did do that when I was playing around with it after I had finished, all you had to do was use a random function for both the user input and computer input. Last edited by 3ICE on Mon Dec 12, 2016 7:12 am, edited 2 times in total.